Yesterday was 93 degrees, with a heat index of 107. For some incomprehensible reason, I decided that attending the Twins game at Target Field, their outdoor stadium, would be a good way to spend the afternoon. I left after the sixth inning, when my sunscreen started melting off. When I returned to my blessedly air-conditioned home, just the thought of turning on the oven sapped away my energy. 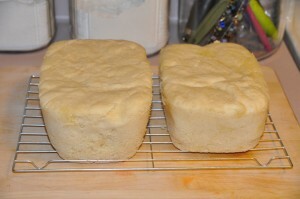 So I decided to try possibly the strangest recipe in Beard on Bread: English Muffin Bread for Microwave Oven. 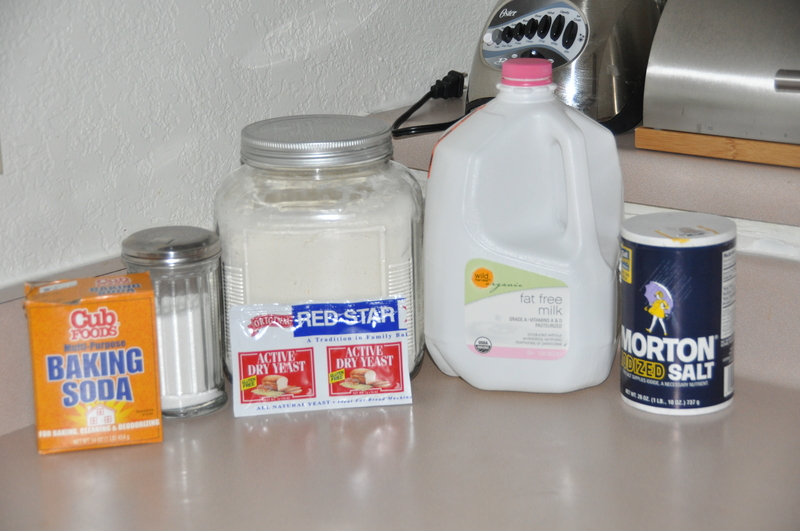 This recipe is very similar to English Muffin Bread, except that it is baked in the microwave instead of the oven. Why? Beard on Bread was first published in 1973, when microwaves were new technology. Baking bread in a microwave would have seemed novel and fun, instead of somewhat weird. 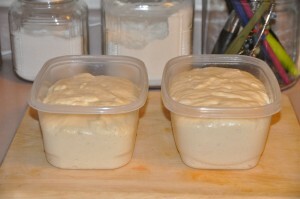 After mixing the ingredients together and letting the dough rise for an hour, I divided the dough between my improvised loaf pans, two microwave-safe plastic containers. I let the dough rise for an additional 30 minutes, and then it was time to microwave my loaves. Since I grew up with microwave technology, I didn’t find watching dough being microwaved all that amusing. Each loaf took 6 minutes and 30 seconds, Beard’s recommended cooking time. 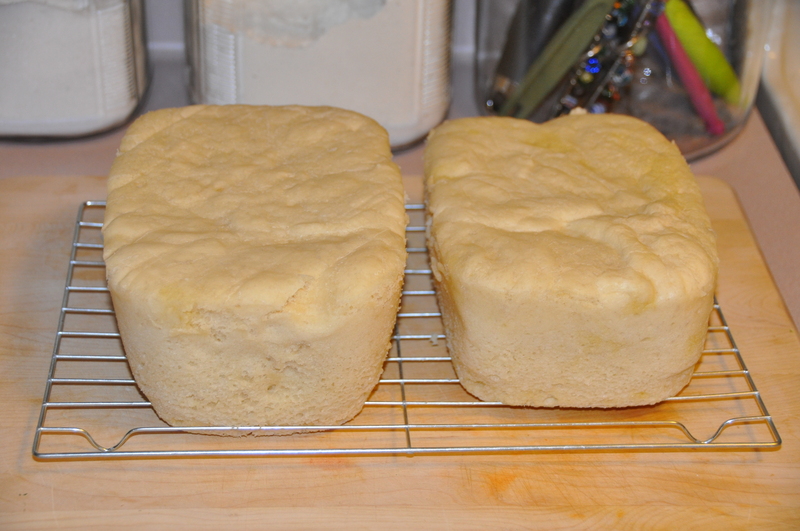 Since microwaving doesn’t brown the bread, my loaves of English Muffin Bread looked like solidified masses of dough–Mike thought they were pretty unappetizing. Despite the odd appearance, the bread’s taste was comparable to English Muffin Bread; however, I thought that the oven-baked version was spongier and had a much better texture. Baking the bread in the microwave only shaves about 13 minutes off the entire process, because you still have to let the bread rise twice. For the time investment, I would rather spend 13 more minutes to bake the bread in the oven and get a better loaf. 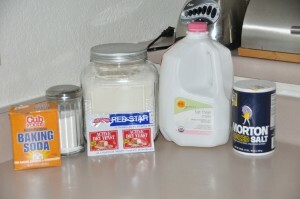 However, for those days when your sunscreen is melting off, English Muffin Bread for Microwave Oven is an edible option.